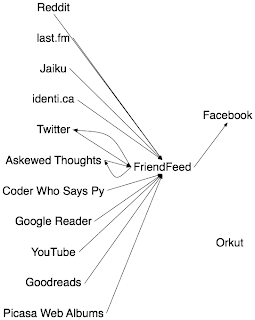 AMK did a post where he graphed is social software connections. I thought that is rather interesting, so I decided to do it myself. Doing this put a couple of things into perspective for me. One is that I like the microblogging services. At the moment I swap between identi.ca and Jaiku. I started to use the former after hearing the creater, Evan Prodromou, interviewed on FLOSS Weekly. Liked his reasoning behind choosing PHP and appreciated it being open source. But I still prefer Jaiku. Plus I have talked to some people while here at Google who are still working on it so I have a personal connection to the app. Twitter is only there because I started to use it for a second time just before the whole rash of fail whales earlier this year hit. And even FriendFeed can do microblogging. But I really should settle down to a single account instead of jumping around. My second revelation is how empowering FriendFeed is. I mean I love the site and consider it one of only two web services I use which I consider invaluable that is not run by Google (the other being Instapaper). But having them all come together into a single location is nice. Plus having various ways to export the information back out (e.g. Twitter and my personal blog) makes it even handier. Third, Facebook is just a walled garden with an information blackhole in the center; information might go in, but nothing comes back out of it to contribute to my presense online. Since I don't use the service to keep in touch with friends and nothing I do within the service can come back out, I have pretty much decided I am going to delete my account. I would rather find some other service where my information can be more useful to me outside of the service itself.